It hasn't been long since the Royal Shakespeare Company (RSC) performed The Merchant of Venice, back in 2011. It was a glitzy modern affair set in Las Vegas with American accents and styled like a television quiz show, but it missed the mark. This version is almost opposite in comparison - a much more simple, stark affair with a stage that is stripped bare decorated with only a huge swinging pendulum. Unfortunately, despite its differences, it still hasn't managed to grasp the essence of one of Shakespeare's most famous plays. It puts the focus firmly on the actors, who sit lined up at the side of the stage throughout. They include renowned Palastinian-Israeli actor Makram J. Khoury as the Jewish protagonist, Shylock; but even Khoury and a superb turn by Patsy Ferran as Portia aren't enough to lift this from being an average production. Performed at the Royal Shakespeare Theatre in Stratford upon Avon until September, The Merchant of Venice has two plots that intertwine. Among the modern business world of Venice, we see racial tensions and prejudice spark vengeful revenge when badly-treated Jewish businessman Shylock demands a pound of flesh for an unpaid loan from Christian merchant Antonio. The Merchant of Venice is a tale about persecution and revenge in Venice. Meanwhile, the rich, clever Portia is being serenaded by men from around the world, who must successfully solve a puzzle left by her dead father to win her hand. Antonio's best friend Bassanio is besotted with Portia and sets off to win her hand. When Bassanio hears of Antony's predicament, Portia steps in under disguise to help overturn the ruling at a court case using her cunning intelligence. Director Polly Findlay returns to the RSC for this production and has attempted to infuse it with inventive ideas that are more miss than hit. It sadly doesn't flow as well as Findlay's successful version of Arden Of Faversham at The Swan Theatre last year. 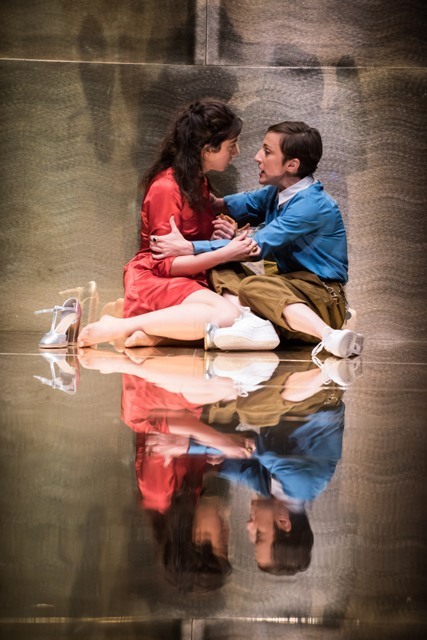 While other Merchant of Venice productions have hinted at a gay relationship between friends Antonio and Bassanio, Findlay has firmly hammered her colours to the mast, showing the pair kissing passionately from the very first scene and portraying Antonio as a jilted, crying lover among his dapper group of sharp suited friends. Findlay has attempted to add more audience participation with scenes involving fool Launcelot Gobbo, but although many of his escapades are hilariously naughty, his clowning around with the crowd doesn't always work or fit in with the rest of the production. Perhaps it would have worked better in a much smaller theatre. It also isn't clear why Launcelot, Shylock's unhappy servant, has been painted with a clown's face when everyone else is in modern day dress. His appearance doesn't fit in with the rest of the contemporary setting. On the plus side, casting Khoury, one of the most celebrated actors in Israel, is a bonus to the production as he adds a sense of realism and depth to the role with his acting, as well as the mannerisms and accent. He's a class act with a lengthy CV over the past 50 years, starring in Steven Speilberg's film Munich and US television series The West Wing as Palestinian Chairman Farad, to name a few. 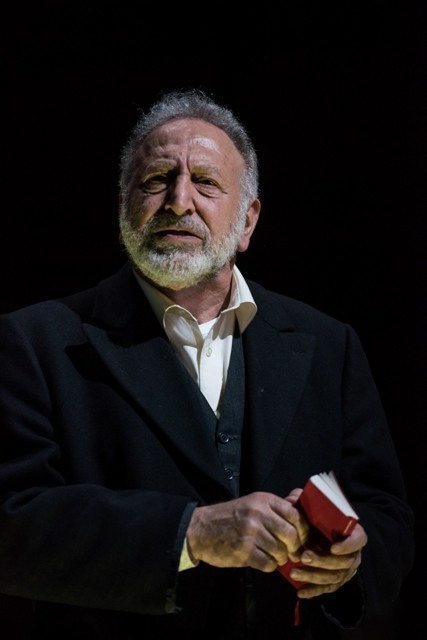 Makram J. Khoury, one of the most celebrated actors in Israel, makes his RSC debut as Shylock. I do feel a little sorry for Khoury that his RSC debut involves him being spat at for much of the play by a motley crew of disrespectful Christian characters. The spitting however does add much more emotion and reasoning to why Shylock would become so unreasonable over taking a man's life. Among the rest of the cast, actress Patsy Ferran is astonishingly impressive as Portia. She won The Most Promising Newcomer prize at this year's Critics' Circle Awards and clearly gives the standout performance of this production. She has created an engaging, complex Portia, who is obviously far more intelligent than the men around her. 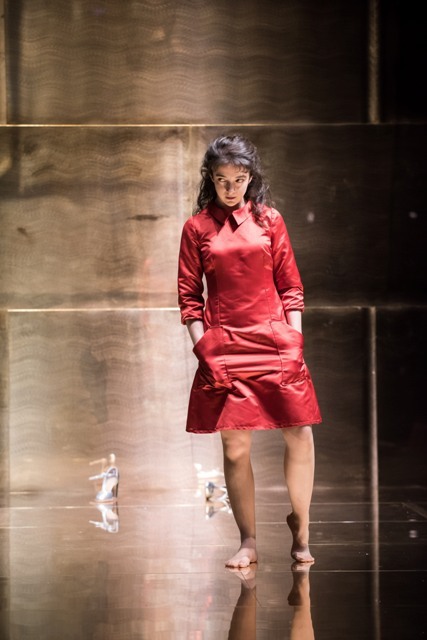 This Merchant of Venice is a short production at only 2 hours 10 minutes (plus the interval) and takes place on a bare stage that cleverly changes appearance from reflective metal to a dark stone effect. 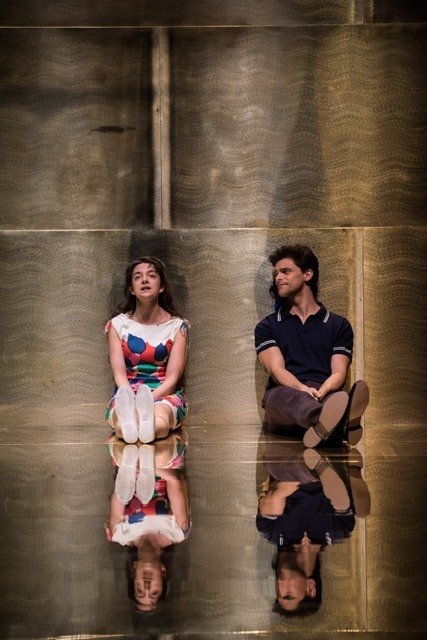 Although plain, it is easily adapted between scenes but it seems strange that Findlay doesn't make use of the impressive hi-tech gadgetry that the RSC offers. Instead, it's more of a sensory experience with choir boys and girls singing sporadically to add atmosphere between the action. 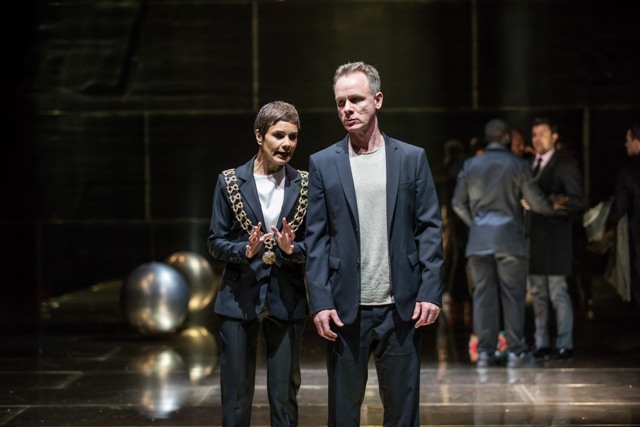 This new production of Merchant of Venice has stripped bare the unnecessary extras and often makes for an emotional piece of theatre. It's interesting to watch and has a well-chosen cast, but it doesn't dazzle the senses. Running time: 2 hrs 10 mins and a 20 min interval. Tickets start from £12 from the RSC website.